When I was growing up on the farm we did not have insurance, and the doctor did not come cheap. My mom learned how to pray and trust home remedies for the minor ailments that bother, and I have taken up the tradition. Although I have to say that sometimes when I have a stomach virus the last thing I want to take is Apple Cider Vinegar…yuck! But, it does work…it’s just torture getting it down. I once heard a lady say that when she has a stomach virus she sprints until she breaks a sweat and the stomach bug vanishes. Can you imagine? I will take the vinegar, please. As colder temperatures sneak up on us and we begin running our electric heat, the opportunity for pesky winter illnesses increases. Today Elinor began a runny nose, and Samuel is congested as well. It’s time to evaluate and begin restocking the medicine cabinet with all my home remedies. I had the thought run through my head yesterday, “What if we all get sick at once?” With schoolwork, the holidays, Slade’s CPA tests, nursing, extra-curricular activities, and all the in betweens that thought made me sort of loose my breath. Time to be proactive. As I prepare for a season of health I am concentrating on prevention… the foundation first. Nutritious food. Lots of garlic and meat broths. Foods high in vitamin C. Speaking of vitamin C, we tried an Ugli fruit this week. The kids got a kick out of the name. Quiet and prayerful atmosphere in the home. Vitamins: D, C, and Zinc as supplements. We like Emergen-C, it’s yummy. Acidophilus: since a prominent part of the immune system is in the digestive tract this is good for overall health. Floradix: an iron supplement with herbs and good B vitamins. Magnesium Oil Spray: helps reduce stress which weakens the immune system. Here is a great resource for making your own. Cutting back on mucus producing dairy products. When the sun is out, so are we. 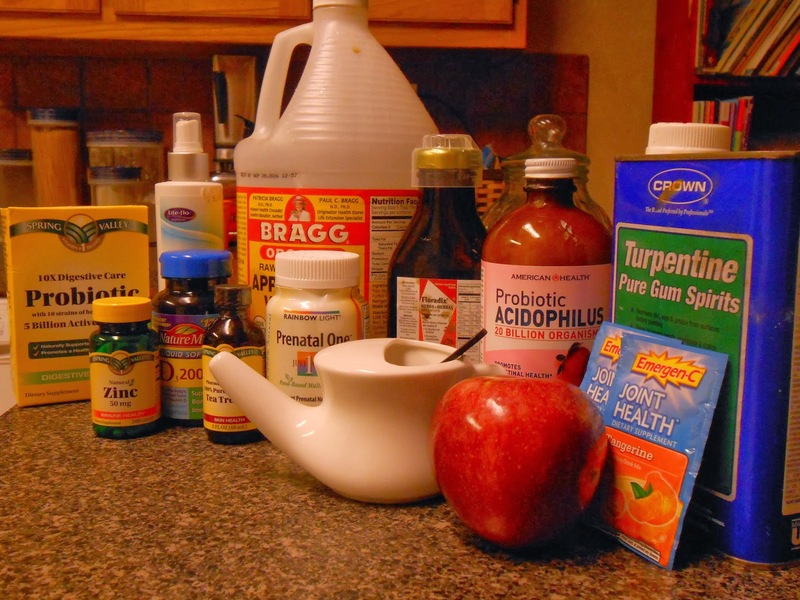 Apple Cider Vinegar– good for soar throats and stomach bugs. In cases of a stomach bug you should start taking the vinegar at the first sign of nausea/ virus and if you throw it up take some more until the vomiting stops. It causes the body to turn alkali, a condition that is not conducive for the virus to live in. It quits multiplying so even if you don’t completely avoid the illness, it will be less severe. My kiddos and I have grown accustomed to taking vinegar straight up, like a shot. I used to mix it with honey, but not anymore. Neti pot– sinus congestion, dry nasal passages from indoor heat, allergies. Whiskey tonic- heat up a little whiskey with honey and fresh lemon juice. Good for a cough before bedtime. Vinegar and honey tonic- heat up a bit of vinegar and honey and sip to ease a cough or soar throat. Tea Tree Oil- do you ever get dry skin soars on your scalp during the winter? Rub a little tea tree oil on them. Epsom salt- put in a warm bath to sooth aching…another good source for magnesium. Blow dryer- set it to low heat and blow into an ear ache. Similason Ear Relief– this is great for ear aches. I am not a fan of giving antibiotics for ear infections. Holy Water and prayer. 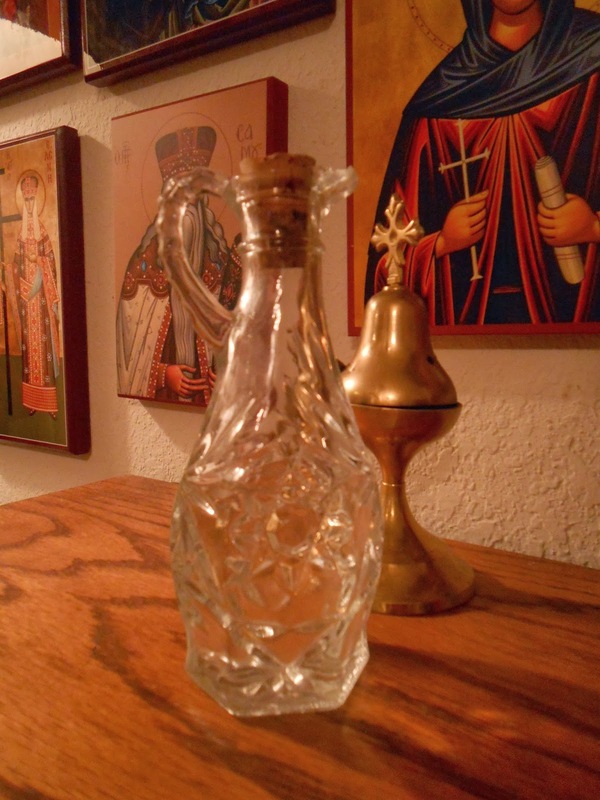 Tonight at evening prayer we gave Elinor and Samuel holy water for it has received grace to heal illnesses. Our bodies are beautifully and wonderfully made. May we all be good stewards and take good care. Previous Post Archangel Michael Week! Thanks for posting this. I knew about some of these, but definitely not all. Thanks so much! This is a great resource page. I use something like a neti pot, just sniffing salt water from the palm of my hand, twice a day pretty much all year long as a preventive. If some bug is colonizing in my nose or throat it gets washed away. I think it works because I don't get the flu or colds…. I am going to do this…my husband used to do this everyday. Thanks for adding. I'm trying to learn about immune health and natural remedies, so this was great to read! Thanks.